One of the hottest trends in wedding jewelry right now is black wedding bands. Black isn’t usually a color we associate with weddings, but as increasing numbers of couples look for ways to make their own ‘big day’ more exciting and unique, wedding bands of this color are starting to be seen more and more. If you’ll be starting to look for a wedding band for your man in the coming months, then black is definitely something you should consider. Here are some tips that will help you to choose a great one. Remember, a wedding band isn’t something that your man will only wear when he feels like it; this is a product he’s going to have on his finger for the rest of his life. What sort of band will he want to wear? While plain black wedding bands are available, you’ll also find two-tone wedding bands as well as products you can customize fully. There are a range of materials that can be used for producing black wedding bands, including gold and titanium. However, the best material for a black wedding band is ceramic. 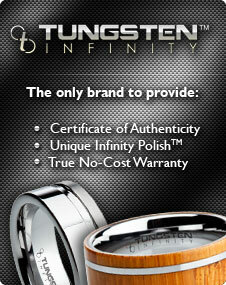 Tungsten carbide (now ceramic and not Tungsten) wedding bands on their own are quickly becoming popular. Today, people understand the strength and durability that a ceramic band can offer, and are buying them as they’re more suited to the rigors of life than a gold or silver wedding band, for example. Ceramic also never loses its shine. If you have a black wedding band and customize it, you’ll have a truly unique product. If you’re buying wedding bands for each other as a surprise, then you’re going to want to do everything to make sure you get a unique, thoughtful product. If you go for a black ceramic wedding band, you have a great opportunity to create something that is truly remarkable and stunning. The shine of the ceramic remains beneath the black coating, so if you customize a black wedding band with a pattern or engraved message, it truly stands out. You might go for a design you think your man will like, or engrave a personal message, the date of your wedding, a line from ‘your song,’ or anything else that means a lot to you. Two-tone wedding bands are a way to have a simpler take on a customized ring should you wish to go down this route. In the event that you do decide to go for a tungsten carbide wedding band, the most crucial aspect is the sizing of the ring. We know you won’t want to spoil the surprise for your man, so make sure you have read about the differences in tungsten ring sizing to ensure you don’t give anything away.